It’s now 11 All-Ireland titles as a manager for the Kilkenny boss. 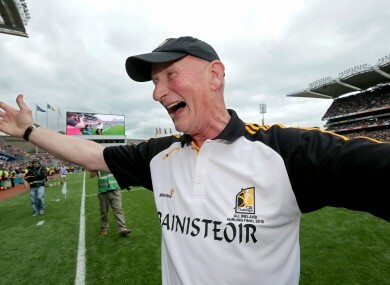 Kilkenny senior hurling manager Brian Cody celebrates following today's All-Ireland final victory against Galway. MANAGER BRIAN CODY played down his role in Kilkenny’s latest triumph after guiding his team to their 11th All-Ireland senior hurling title in 16 seasons. The Cats rebounded from a below-par first-half performance to overcome Galway on a scoreline of 1-22 to 1-18 in today’s final at Croke Park. “We’re absolutely thrilled, obviously,” Cody told RTÉ. “In the first-half, Galway were outstanding, they really hit us, they really knocked us back in different ways, and we struggled to get into a rhythm, I suppose. Despite trailing by 0-14 to 1-8 at the midway point of the game, Cody said his players didn’t panic in the dressing room at the interval. When asked where this latest victory ranks among its 10 predecessors, Cody said: “Right now it’s a brilliant one. Every year you win an All-Ireland final it’s just a brilliant feeling. I don’t rank them or I don’t take stock of them either, to be honest with you. It was just about winning today’s match. Winning the All-Ireland final is everything. Email “Cody: 'I've yet to see a match that was won on the sideline'”. Feedback on “Cody: 'I've yet to see a match that was won on the sideline'”.